This auction has many great pieces from a Buckhead Estate. 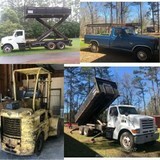 This auction is online only at www.mariettaauctionhouse.com and opens November 30th at 10 am! RESTAURANT AND MATERIAL HANDLING EQUIPMENT SALE! This auction conducted by J. Durham & Associates, Inc.
12,659 SQ. FT. OFFICE BUILDING DESIGNED AS A BANK DATA PROCESSING/CALL CENTER. Selling a total of 9.71+/- acres at the intersection of Hwy. 197 & Hardman Road in Clarkesville, GA.
Hwy. 197 & Hardman Rd. Selling all remaining assets of WasteTech, LLC. Assets being sold include 150+ roll off dumpsters, multiple roll off trucks, portable toilets and other related commercial assets.